[curlx,curly,curlz,cav] = curl(X,Y,Z,U,V,W) computes the curl (curlx, curly, curlz) and angular velocity (cav) perpendicular to the flow (in radians per time unit) of a 3-D vector field U, V, W.
[curlz,cav]= curl(X,Y,U,V) computes the curl z-component and the angular velocity perpendicular to z (in radians per time unit) of a 2-D vector field U, and V.
[curlx,curly,curlz] = curl(...), [curlx,curly] = curl(...) returns only the curl. cav = curl(...) returns only the curl angular velocity. 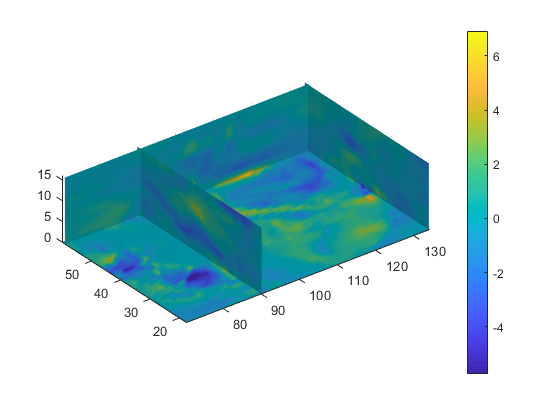 Use colored slice planes to display the curl angular velocity at specified locations in the vector field. Display the curl angular velocity in one plane of the volume. 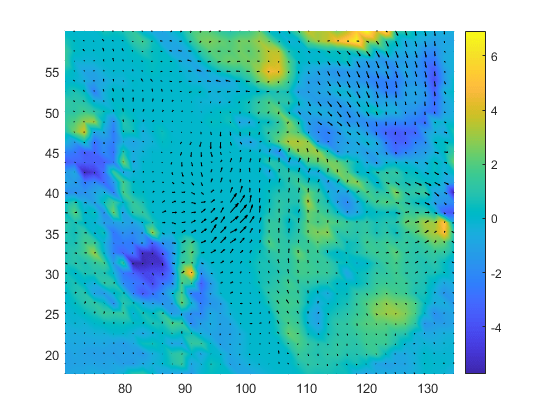 Then plot the velocity vectors in the same plane.